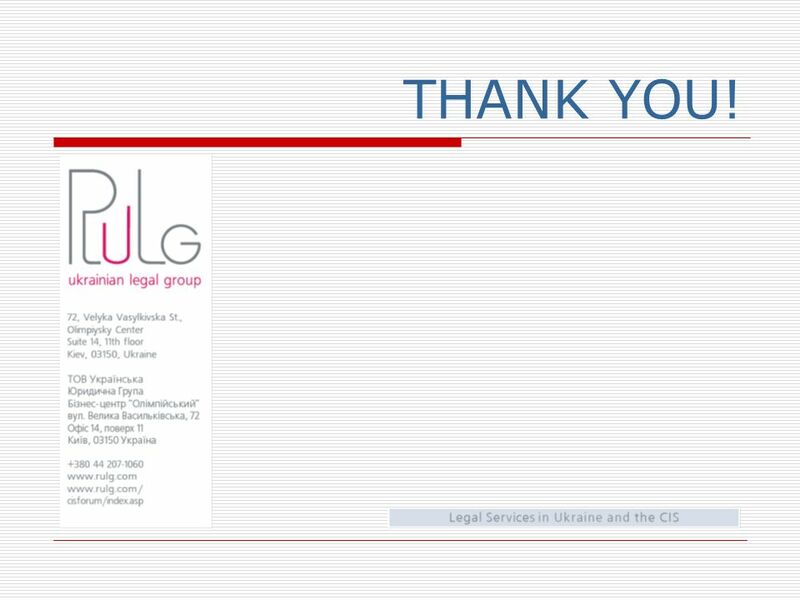 The Latest Developments in Ukraines Intellectual Property Laws and Data Protection. 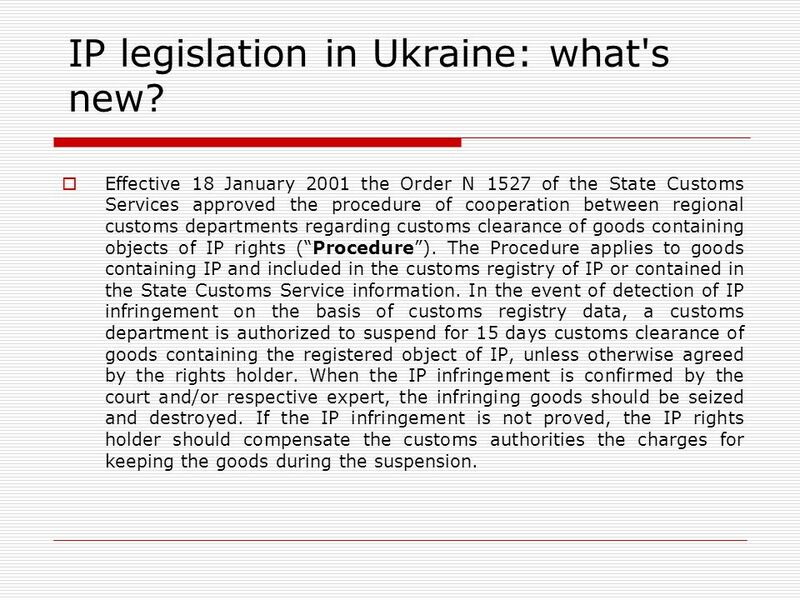 2 IP legislation in Ukraine: what's new? 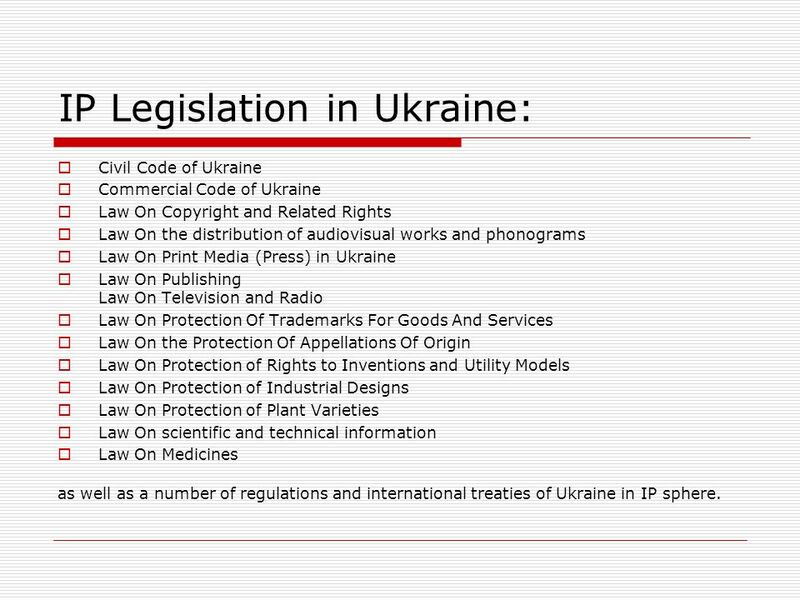 IP legislation is considered to be one of the most stable in Ukraine. The latest significant amendments were made to a number of IP legislation connected with Ukraines accession to WTO in 2008. However, some sectors of the IP legislation are expected to be modified in the coming years in order to improve the protection of patent rights in certain industry sectors such as pharmaceuticals and agriculture. There was a substantial increase in the number of the patent disputes considered by and pending at Ukrainian courts, though the overall number is still relatively small. 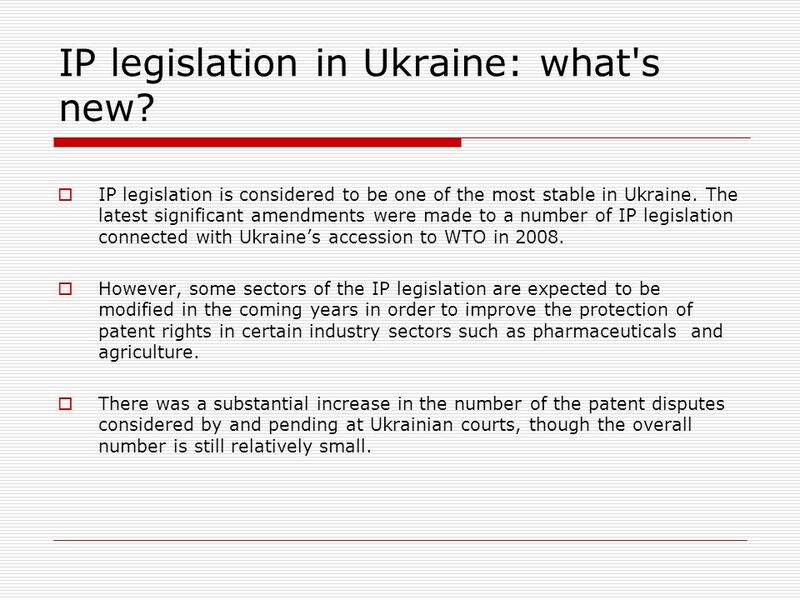 3 IP legislation in Ukraine: what's new? Effective 18 January 2001 the Order N 1527 of the State Customs Services approved the procedure of cooperation between regional customs departments regarding customs clearance of goods containing objects of IP rights (Procedure). The Procedure applies to goods containing IP and included in the customs registry of IP or contained in the State Customs Service information. In the event of detection of IP infringement on the basis of customs registry data, a customs department is authorized to suspend for 15 days customs clearance of goods containing the registered object of IP, unless otherwise agreed by the rights holder. When the IP infringement is confirmed by the court and/or respective expert, the infringing goods should be seized and destroyed. If the IP infringement is not proved, the IP rights holder should compensate the customs authorities the charges for keeping the goods during the suspension. 4 IP Legislation in Ukraine: Civil Code of Ukraine Commercial Code of Ukraine Law On Copyright and Related Rights Law On the distribution of audiovisual works and phonograms Law On Print Media (Press) in Ukraine Law On Publishing Law On Television and Radio Law On Protection Of Trademarks For Goods And Services Law On the Protection Of Appellations Of Origin Law On Protection of Rights to Inventions and Utility Models Law On Protection of Industrial Designs Law On Protection of Plant Varieties Law On scientific and technical information Law On Medicines as well as a number of regulations and international treaties of Ukraine in IP sphere. 5 Personal Data Protection Regime Effective 01 January 2011, the Law On Personal Data Protection (the Law") took effect introducing requirements for the gathering, processing, storing, and transferring of personal data. 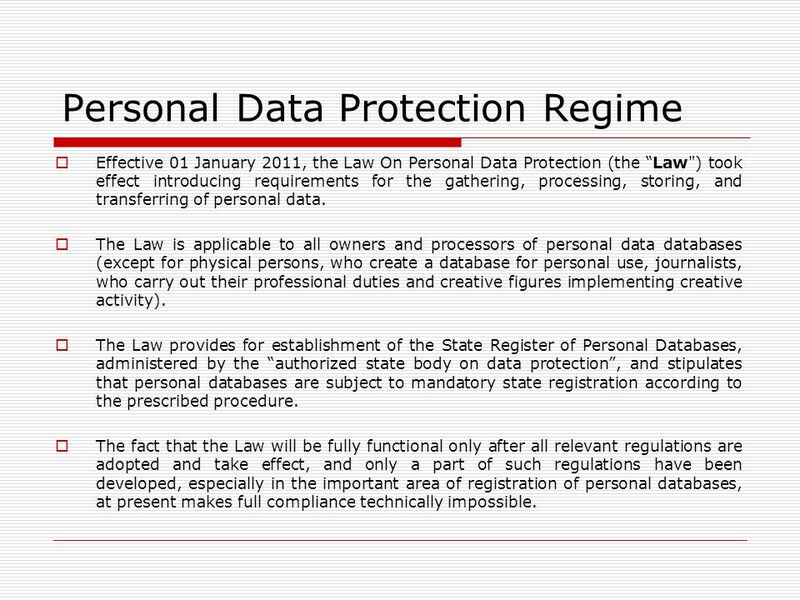 The Law is applicable to all owners and processors of personal data databases (except for physical persons, who create a database for personal use, journalists, who carry out their professional duties and creative figures implementing creative activity). The Law provides for establishment of the State Register of Personal Databases, administered by the authorized state body on data protection, and stipulates that personal databases are subject to mandatory state registration according to the prescribed procedure. The fact that the Law will be fully functional only after all relevant regulations are adopted and take effect, and only a part of such regulations have been developed, especially in the important area of registration of personal databases, at present makes full compliance technically impossible. 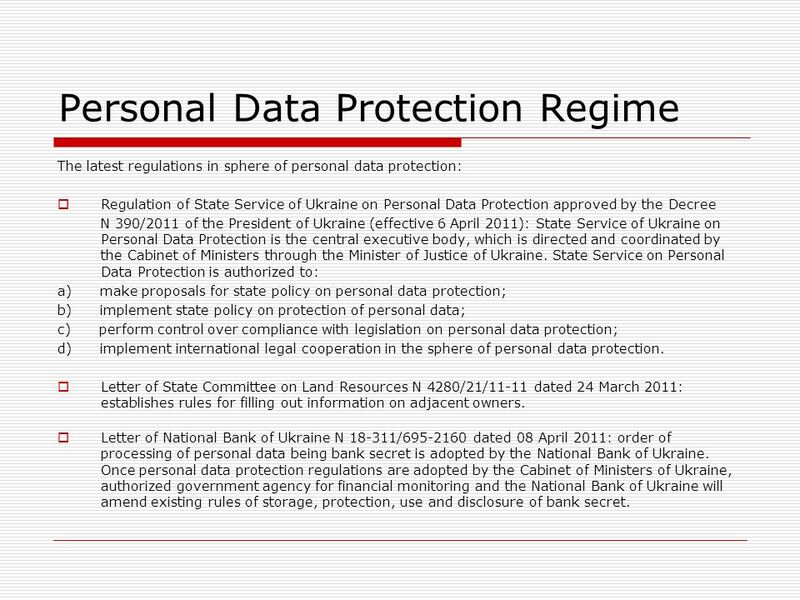 6 Personal Data Protection Regime The latest regulations in sphere of personal data protection: Regulation of State Service of Ukraine on Personal Data Protection approved by the Decree N 390/2011 of the President of Ukraine (effective 6 April 2011): State Service of Ukraine on Personal Data Protection is the central executive body, which is directed and coordinated by the Cabinet of Ministers through the Minister of Justice of Ukraine. State Service on Personal Data Protection is authorized to: a) make proposals for state policy on personal data protection; b) implement state policy on protection of personal data; c) perform control over compliance with legislation on personal data protection; d) implement international legal cooperation in the sphere of personal data protection. Letter of State Committee on Land Resources N 4280/21/11-11 dated 24 March 2011: establishes rules for filling out information on adjacent owners. Letter of National Bank of Ukraine N 18-311/695-2160 dated 08 April 2011: order of processing of personal data being bank secret is adopted by the National Bank of Ukraine. Once personal data protection regulations are adopted by the Cabinet of Ministers of Ukraine, authorized government agency for financial monitoring and the National Bank of Ukraine will amend existing rules of storage, protection, use and disclosure of bank secret. 7 Personal Data Protection Regime Court practice Overview of court decisions for period January-May 2011 indicates that judges already make references to the Law in decisions concerning circulation of information. 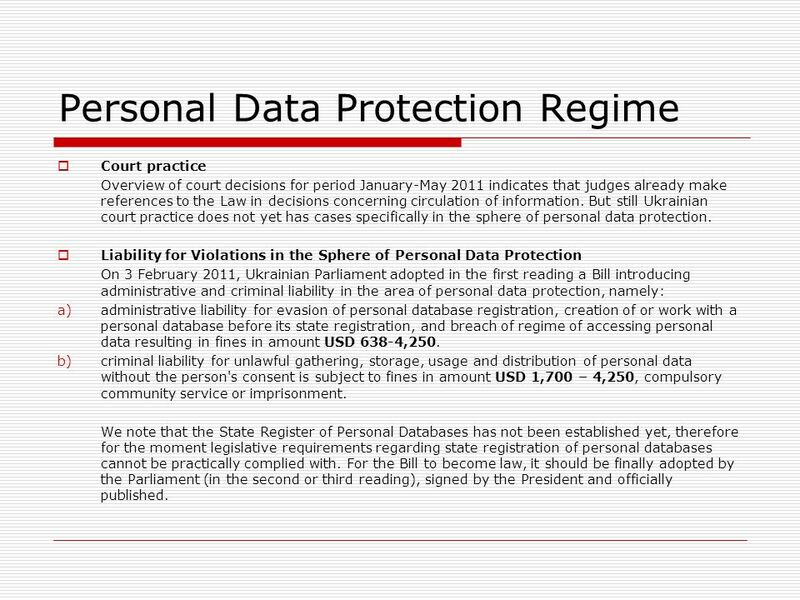 But still Ukrainian court practice does not yet has cases specifically in the sphere of personal data protection. Liability for Violations in the Sphere of Personal Data Protection On 3 February 2011, Ukrainian Parliament adopted in the first reading a Bill introducing administrative and criminal liability in the area of personal data protection, namely: a)administrative liability for evasion of personal database registration, creation of or work with a personal database before its state registration, and breach of regime of accessing personal data resulting in fines in amount USD 638-4,250. b)criminal liability for unlawful gathering, storage, usage and distribution of personal data without the person's consent is subject to fines in amount USD 1,700 – 4,250, compulsory community service or imprisonment. We note that the State Register of Personal Databases has not been established yet, therefore for the moment legislative requirements regarding state registration of personal databases cannot be practically complied with. For the Bill to become law, it should be finally adopted by the Parliament (in the second or third reading), signed by the President and officially published. 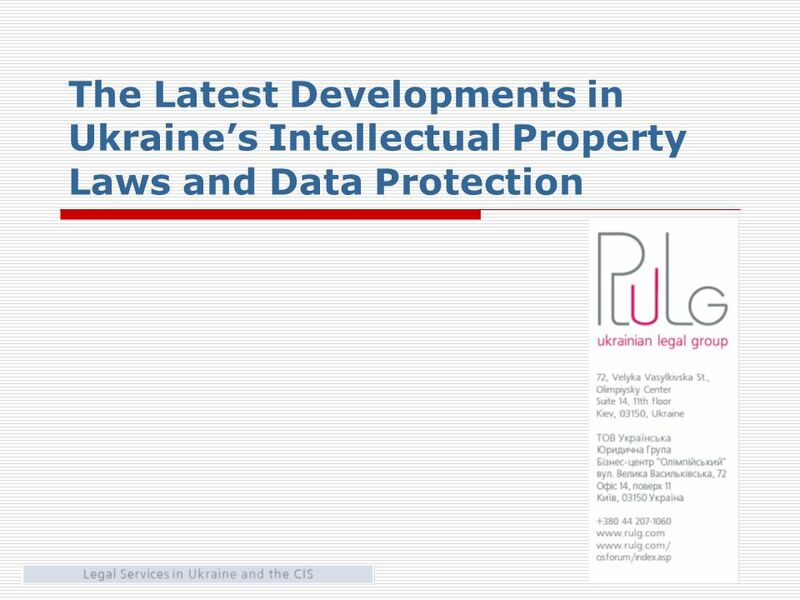 Download ppt "The Latest Developments in Ukraines Intellectual Property Laws and Data Protection." MINISTRY OF ENVIRONMENT AND WATER REPUBLIC OF BULGARIA Bulgaria and the Basel protocol on liability and compensation. Regional Workshop Warsaw, January 2006 STATE UNION OF SERBIA AND MONTENEGRO Basel Protocol on Liability and Compensation Questionnaire No. 2 Ratification. Trademark enforcement in Belarus AIPPI Baltic, Vilnius, 2013 Darya Lando, Head of Legal Department LexPatent, Minsk, Belarus. Intellectual Property Office of Serbia Country Report WIPO Regional Conference Development of National IP Strategy Sibiu, June 21 to 22, 2012. Counterfeit and Pirated Goods 6 th April Relevant Acquis Icelandic Legislation International Conventions Customs Intervention Preconditions Time. TAX Yuliana Revyuk, KPMG in Ukraine Investment in Ukraine: Certain key tax issues. Copyright Defined Copyright is a legal term describing rights given to creators for their literary and artistic works. Kinds of works covered by copyright. Challenges and Opportunities to Utilize TRIPS Flexibilities in Current Ukrainian Legislation: Potential Impact of IP Provisions in the Proposed EU FTA. FIGHT AGAINST CORRUPTION November 2008. PART FOUR – COMMERCIAL LEGISLATION in the UAE Legislative Structures affecting business in the UAE: An Overview Ch 16. Foreign economic activity participants Foreign economic activity participants – a legal entity or an individual registered as individual entrepreneurs. GENERAL ALBANIAN PATENTS AND TRADEMARKS OFFICE Sub-regional seminar on the commercialization and enforcment of intellectual property rights. 1 China Internet Network Information Center （ CNNIC ） Administrative Practice of.CN Domain Names. THE ROLE OF INTELLECTUAL PROPERTY RIGHTS IN PROTECTING TRADITIONAL KNOWLEDGE The Philippine Experience Presented by: Marga C. Domingo-Morales Senior Policy.